Every summer, the NEH offers faculty development programs for K-12, community college, and university educators at locations across the country. Our brochure of 2014 summer programs is now online here. These programs allow teachers to learn about the history of a place firsthand, explore archival materials, meet experts in the program field, work collaboratively with their peers, and develop lesson plans for the upcoming school year. 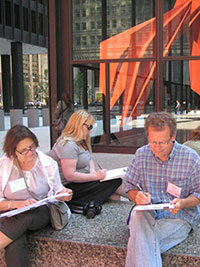 Teachers attending the Chicago Architecture Foundation Landmarks of American History workshop. We will host a webinar on these programs on Thursday, December 12th at 5pm ET. Register here: https://www4.gotomeeting.com/register/848402631. Explore the PowerPoint from our previous webinar to learn more about these programs: Summer Programs for School and College Educators.